The first four teams of the competition will play in a Championship Play-off Round in which they start with half the points earned during the regular season. The teams finishing in the last two positions will participate in a Relegation Play-off round. In the event of a points tie the following will apply: 1. Most wins. 2. Goal difference. 3. Most scored goals. Get all of K.S.K. Heist W latest football results for every football game they have played. See how K.S.K. Heist W has gotten on in the 2018/2019 league tables, cup competitions and friendly games including the Super League Women & Super League Women football tournaments. Get every football score, football fixture and football stats for K.S.K. 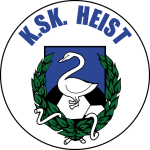 Heist W in the 2018-2019 football season only at ScoresPro - the #1 Football livescore website for K.S.K. Heist W! Get the latest K.S.K. Heist W football scores and all of the K.S.K. Heist W stats for all Super League Women & Super League Women games in the 2018-2019 season only at ScoresPro, the #1 football & soccer livescore website for K.S.K. Heist W football!